As early as I can remember I have always loved orange juice with breakfast and throughout the day. Like many Americans in the morning ,orange juice is a colorful and healthy way to stay on top of a cold, and away from the expensive doctor. Could you imagine a breakfast without orange juice? Well I couldn’t, but it may be in the horizon. A disease called citrus greening has been seen in Florida. Citrus greening (Candidatus Liberibacter asiaticus) is a bacteria disease that is not harmful to humans but will kill and decline the production of a tree in as little as 5 years. This disease is not treatable once the tree has it. According to the University of Florida, citrus greening is found in Asia, Africa, Indian subcontinent, Brazil, and the United States. The disease causes the fruit to become smaller, and have a green tint even when ripe. Also, according to APHIS, it also causes leaves to turn yellow, blotchy mottling, poor flowering, and dieback. The spread of the disease is done by Asian citrus psyllids when they feed on the leaves or stems, says APHIS. Other host plants include grapefruit and lemon, and limes. Diseases are spreading from country to country every year. I don’t want to see a morning or go a hot afternoon without some lemonade or orange juice, and I think the rest of America can say the same. If you want to help, APHIS says to please look up citrus greening and the psyllids and if you are in Florida, or other states with citrus and you see symptoms contact your local USDA office. Next time you buy your friend or co-worker ornamental bamboo make sure you know where it is sourced from. Recently the hearty plant has been impacted by pathogens and diseases. Many people believe all bamboo is the same, however several varieties exist for specific hardiness zones, growth rates, and other decorative factors. Varieties range from lucky bamboo on a desk to square bamboo that Giant Pandas eat. All of these varieties of bamboo are at risk of death. The current risk is “bamboo mosaic virus”. This virus has become more common in lucky bamboo due to the lack sanitation in the nurseries where it is grown. Focus relies cutting and propagating new shoots instead of sterilizing equipment. Improper sterilization is a leading cause for viruses and bacteria to spread geographically and interspecies. Next time you want to buy a plant for a friend to sit on their desk. Consider the virus that could be transmitted, the bamboo that can be diseased and destroyed, and non-living decorations that will not host viral diseases. Growing up on a grain and hog farm in central Ohio I’ve grown up with the mindset of always asking questions. About three to four years ago I remember a lot of local farmers complaining of having issues with a mold in the grain they were selling, and were unable to sell. Well it’s back again. The mold vomitoxin or DON. But this time it wasn’t farmers complaining of being unable to sell there grain, it was coming from hog farmers and their hogs not growing. Vomitoxin is a type of mycotoxin that can be found in corn and wheat and other grains. These mycotoxins are produced from some molds, such as Fusarium ear rot and other ear rots. It all depends on the weather conditions at the mature phase of the ear. Along with weather some insect can carry molds from ear the ear. Now you’re thinking how does mold on corn affect me? I don’t eat field corn? Well it does indirectly. Corn is the major food stuff for the diet of hogs. When hogs consume the corn the toxin will accumulate in the meat. Along with the accumulation the mycotoxin causes the hog to not eat as much then leading to a decrease in the hog’s growth and weakened immune system. According to a report by Iowa state hogs will reduce their intake in feed if it contains 1-3 ppm. According to Iowa State University Extension, to help minimize the vomitoxin, store the grain at 16-17 percent moisture, if the corn is moldy it must be stored at 15 percent. If the field is infected, early harvest will help minimize the accumulation of the mycotoxin while stored aeration will help prevent the spread throughout the bin. Early detection will help the overall process. My name is Skyler Foos and I am a Senior at The Ohio State University Majoring in agronomy. I currently have an Associate’s degree from Ohio State university ATI in Agronomy. I live on a 900-acre Grain and Hog farm in central Ohio. In the past several years, a virus infecting citrus crops has become increasingly hazardous to food security and plant health in the United States. The virus has largely impacted other countries previously, but did not spread to the US until recently. According to Bar-Joseph et al. it is a very difficult virus to manage. The virus is known as the tristeza virus (CTV) and is vectored by aphids. It has been the cause of millions of citrus trees to decline in health and die and is one of the most significant citrus diseases in recent years. It appears to be mostly a problem exacerbated by man because of the introduction of new varieties into citrus fields (and use of sour orange rootstock in cultivation). The virus is not transmitted by seeds but can be spread by infected trees (grafts) shipped from Asia. Like most viral plant diseases, infected plants can be asymptomatic or produce symptoms of other plant health problems. Florida grown citrus plants have taken a huge hit from CTV. 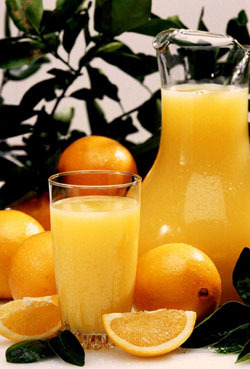 Because of Florida’s climate, oranges tend to grow juicier compared to climates like California and thus a significant portion of orange juice production is in Florida. CTV has impacted the citrus growing industry greatly in Florida and other parts of the world. The types of citrus most susceptible to the decline strain are sweet oranges grown on a sour-orange rootstock. The virus is so devastating because it can cause stem splitting in citrus trees that are not grafted on sour-orange rootstock. It spreads very rapidly and the introduction of a certain species of aphid in the mid 90’s was the start of the epidemic that is now affecting the citrus production in Florida. My name is Emily Hayes. I am a senior at The Ohio State University majoring in Sustainable Plant Systems with a specialty in Horticulture and minoring in Soil Science. I currently work at The Chadwick Arboretum, located on OSU’s campus. Mountain Pine beetle, Dendroctonus ponderosae, is a species of bark beetle. They feed on the inner bark of ponderosa, lodgepole, limber, and scotch pines of the western United States. MPB prefer older, stressed trees because, as a defense, healthy trees produce resins that can physically push the beetle back out of the tunnel they have burrowed and encase them in a sticky tomb. The more stressed a tree is, the less resin it produces. MPB is responsible for the death of great swaths of forest throughout the Rockies. Upon maturity, an adult beetle will emerge from a tree and fly to another, guided by the scent of terpenes. Older trees produce a different scent than younger trees, allowing the beetle to differentiate between the two. Once a female beetle has found an appropriate tree and a mate, she will dig out a gallery and lay her eggs. Once the eggs are laid, the adult beetles will die. MPB have a complete lifecycle, meaning they hatch from their eggs, grow into larva (the overwintering stage), pupate, and then emerge as adults to begin the cycle again. One very interesting part of the story takes in the high elevation forests of above Nevada, outside of Great Basin National Park. In these 10,000+ ft tree stands, scientists from the Rocky Mountain Research Center in Utah have noticed that not a single bristlecone pine has been killed by the MPB, despite growing in mixed stands with limber pines. Bristlecone pines are among some of the oldest living organisms in the world – some have been aged at 5,000 years old! It could be that bristlecone pines encountered the beetle thousands of years ago and have since evolved MPB specific defenses. Bentz BJ, Hood SM, Hansen EM, Vandygriff JC, Mock KE. 2017. Defense traits in the long-lived Great Basin bristlecone pine and resistance to the native herbivore mountain pine beetle. New Phytol. 213(2):611-624. This article is regarding the American Chestnut tree and its path to overcome the exotic pest fungus that has historically decimated its populations. Anyone who has grown up in the American hardwood and Appalacchian areas knows that the American chestnut used to be an important hardwood timber tree. The total number of American chestnut trees was estimated at over three billion with 25% of the trees in the Appalachian Mountains being American chestnut. This was of course before the chestnut blight was introduced to the United States. 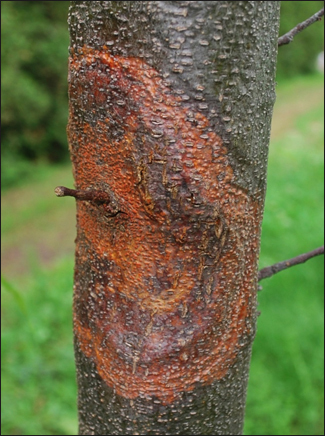 Chestnut blight is caused by the Asian bark fungus Cryphonectria parasitica. It was accidentally introduced to North America on imported Asiatic chestnut trees. Since the Chinese chestnut trees have evolved alongside of this pathogen they are not susceptible though the American trees were highly susceptible. The airborne fungus spread 80 km a year and in a few decades killed up to 3 billion American chestnut trees. This reduced population was scattered among Appalachia and many were saddened by the loss of their beloved chestnut forests. Trails and parks have been named after this iconic American hardwood such as ‘yellow mountain’ and’ yellow gap’ that are named when in fall the whole mountain would be turned golden from the changing colors of the chestnut’s leaves. Just as soon as it might be an end to true chestnut trees in the U.S., technological breakthroughs are bringing them back. A new transgenic breed of American chestnut is resistant to the fungus and aims to help restore these forest giants to their home. A group at SUNY College of Environmental Science and Forestryhas successfully created a transgenic hybrid of these trees and is beginning to plant them in the forest. There is still a lot of work that needs to be done to restore the forest ecology but with advances like this, the future for the Appalachian forest seems promising. Blog post written by Jonathan LaBorde at The Ohio State University, Bachelors of Science in Agriculture – Major Horticulture. The elm tree, a common shade and wind break tree in the U.S., has been dying due to Dutch elm disease. The first strand was brought over from Europe in the 1920s, while the second strand of Dutch elm disease was brought over later. This strand finished killing what trees the first strand had left alive. 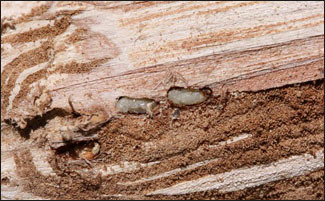 Dutch elm disease is a fungus that is spread by the elm bark beetle. The beetles were introduced to the U.S. first, and the fungus shortly followed. The fungus was first introduced when carpenters imported European elm logs with the fungus inside. 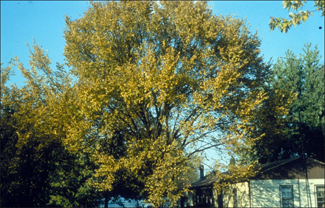 Dutch elm disease reached the west coast of the U.S. in 1973. Dutch elm disease has killed 40 million American elm trees. Many of the elms that we planted were street trees to provide needed shade for front yards and streets. Most of these plantings have been killed off. The introduction of diseases and pests like Dutch elm disease give reason why we need to be careful with international trade. Diseases and pests in certain areas of the world can destroy essential crops if brought into the areas in which the crops are produced. The protection of the global food supply is why there is so much security concerning plants, plant products, soil and containers. The protection of U.S. food and global food is dependent on us, the normal person, to help stop the spread of devastating diseases and insects. So, remember the next time you travel to clean your shoes, check your souvenirs for tag-a-longs and do not bring soil home with you. My name is Daniel Zellers. I am a fourth year at The Ohio State University. My major is Sustainable Plant system with a specialization in Horticulture and my minor is in Agribusiness. Fuel for the Fire, but no Ashes? For the past few years Ohioans like myself have not had to look far to get good firewood. Indeed, it is hard to find a park where decreased forest canopies and the stumps of ash trees are not evident. The losses can be credited largely to a beetle whose name designates it as more of a gem than it really is. Since 2003 the Emerald Ash Borer has been extending its domain throughout Ohio, along with other states. 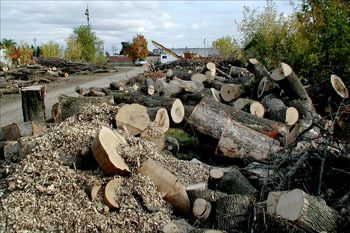 Not only has this epidemic affected the temperate forest biome, as well as residential scenery, but industries such as baseball bat producers are feeling the effects of depleted ash tree supplies. We have grown accustomed to seeing “Don’t move firewood!” signs near our roadways, but now that the statewide quarantine is lifted, it seems we have given up on the Ash tree. However, the Forest Service has been testing ways fight this catastrophic pest. One strategy was introducing a predatory wasp. Another, is attracting masses of the pest to one host tree by removing the bark, and subsequently disposing of it and its parasitic inhabitants. The borer, Agrilus planipennis, works by eating away at the vascular tissue within host trees, thus depriving its upper shoots of nutrients and water. The end comes quickly as foliage depletes, along with photosynthesis, and trees are dead within a few years of infestation. Thankfully, there are insecticides that can help against the beetle, but as in most treatments, early action is necessary to be successful. Treatments are cost effective only for small scale needs, but it is encouraging to see resources available to preserve the trees where plausible. Being a lifelong Ohioan and lover of shade, I hope to see progress in efforts to halt the loss of one of our native ash trees. Boden Fisher is an undergraduate student at The Ohio State University, majoring in Sustainable Plant Systems with a specialization in Agronomy. He plans to graduate in 2018 and pursue the advocacy of modern agricultural practices in low-income areas and contribute to advancement of sustainable food systems. Soybean Cyst Nematode disease is a large issue in agriculture today. It is a large unforeseen problem because only the soybean nematode cyst can be seen with the naked eye. Soybean cyst nematode damage is also costing American farmers over one billion dollars a year in crop losses. Many times the soybean cyst nematode can be blamed for other diagnostic problems such as a nutrient deficiency or it could be missed if another pathogen is present. The soybean cyst nematode is also known by its pathogen name Heterodera glycines. It can infect soybeans and other plants in the legume family. It is found in soil and plants, and has a sedentary endoparasite lifestyle. The sedentary endoparasite lifestyle means that once it is inside the plant root it stays inside the root for the rest of its life cycle. To know if you have the soybean cyst nematode you should be able to recognize the signs and symptoms. The signs of soybean cyst nematode are the female egg cyst that a very small but can be seen in the soil often by plant roots. The symptoms of soybean cyst nematode disease are stunting, yellowing and overall reduced yields in plants. Note that this is often similar to other problems. Another great diagnostic tool to help you see if you have the pathogen in your soils is knowing the lifecycle of the soybean cyst nematode. The soybean cyst nematode overwinters in the soil and begins its life in a cyst, which is a remnant of the female’s body with unhatched eggs inside of it. After the eggs hatch from the cyst and the individual egg itself; it has the normal shape of the nematode and begins to infect a plant around it in the soil. After infecting the plant the soybean cyst nematode continues its lifecycle until till it reaches adulthood, then the males and females will exit the root to mate; the females with become a cyst after their lifecycle is complete. To help the control the soybean cyst nematode there are a few useful management practices that can be used. Crop rotation can be used to disrupt lifecycles during different growing seasons. Planting resistant crop varieties and applying nematicides can also be helping in fighting the soybean cyst nematode.